I’m a sucker for carbolicious staples like rice, pasta, bread, couscous. If it’s going to peak your insulin, I’ll have it, thanks. For me a lot of the attraction, I’ve come to realise, is the relative blandness, and the texture. The way these things soak up sauces and dressings and provide some ‘space’ in between rich flavours. Using cauliflower as an alternative to a starchy carb has become one of my new pleasures. 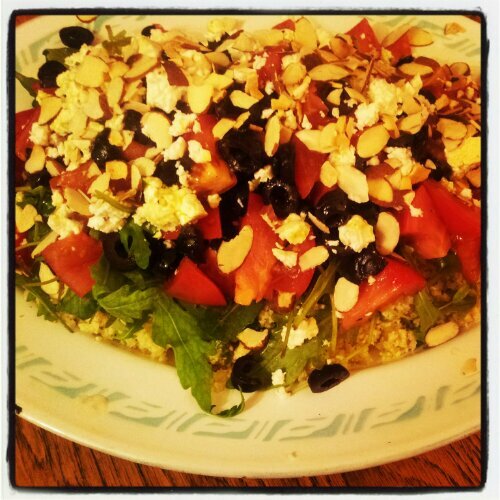 I’d use it anywhere I might use rice, couscous (whatever ethnicity…), freekeh, millet, orzo. Take one large head of cauliflower and remove the thick stem as well as any thick stalky bits, placing all the florets into the bowl of a large food processor. It goes without saying that you’d want to cut off any browned bits first, too. Pulse the florets until you reach the consistency you like. One cauli makes a whole heap of rice, so if you’re cooking for two adults, you’ll probably want to freeze half of this for another meal. In a large frypan, sauté onion and garlic until nicely soft. Add preferred spices. This will depend on what you’re serving with the rice. For the meal above I added some cumin, nutmeg and sweet paprika, and a little salt and pepper. Stir until fragrant, then add the cauli rice. 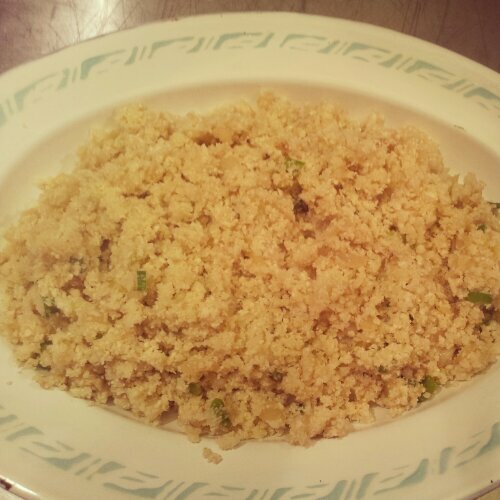 (here I added some chopped spring onions, too). Stir continuously for about 5 mins, until the cauli has softened but still retains texture. Serve as a base for whatever you like. 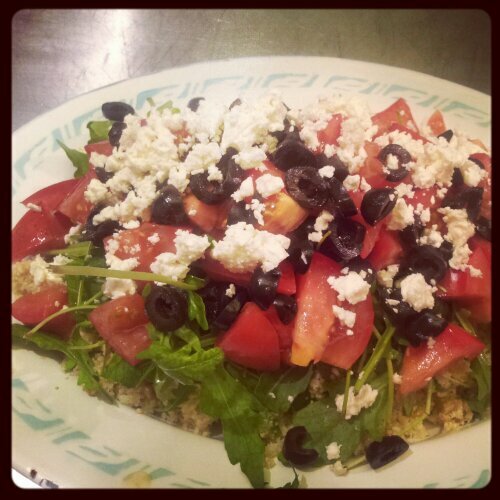 Here I topped my cauli rice with a kind of Greek-inspired salad: first with a layer of rocket leaves, then diced tomatoes, chopped black kalamata olives, and crumbled goat’s feta. I sprinkled over some toasted flaked almonds and poured over a dressing of olive oil, white wine vinegar, a little mustard and honey, salt and pepper. 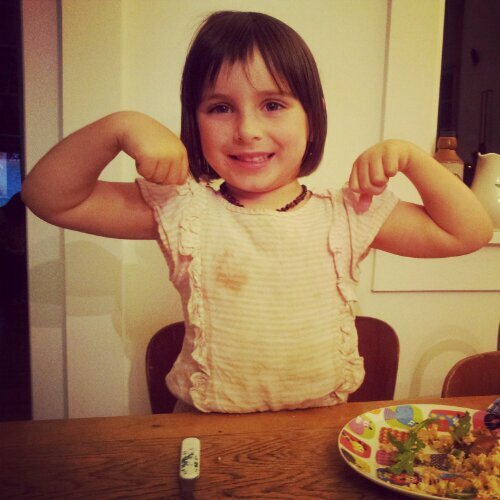 My kids quite liked it – well, one ate a fair bit, and really liked it, as you can see (salad makes her strong, she tells me). This my dear Anna, is simple and brilliant! I’m carbolicious too but I do like the idea of this cauli version. For me, carbs are comfort food. I’d happily eat a bowl of rice with sauce. There’s nothing quite like the feeling of being full. And while being almost full is good enough for some, you’ll never feel that same full unless you eat carbs.